1 of 3 Bring a pot of lightly salted water to a boil. Add soba pasta; cook 6 minutes. Drain and rinse well with cold water. Set aside. 2 of 3 Meanwhile, add 1 tbsp of the oil to a large saute pan over medium heat. Add shrimp, ginger and garlic. Cook 2 to 3 minutes until shrimp are cooked through. Remove to a very large bowl. In the same saute pan, add remaining 1 tbsp oil over medium heat. Stir in carrots; cook 2 minutes. Stir in cabbage; cook 4 minutes, until wilted. Stir in 1 cup of the scallions; cook 1 minute. Remove vegetables to bowl with shrimp. 3 of 3 Whisk together cold vegetable broth, soy sauce, vinegar, cornstarch and sesame oil until smooth. Pour into same saute pan over medium heat, scraping the bottom of the pan to break up the bits. Bring to a boil and cook 1 minute. 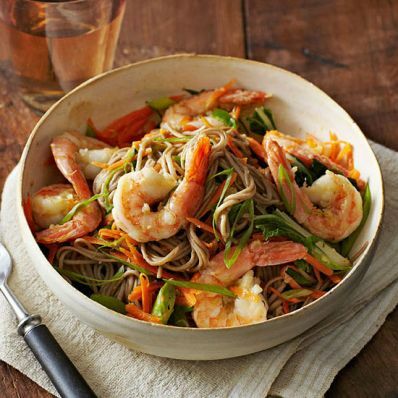 Pour into bowl with shrimp and vegetables; stir in cooked soba pasta. Serve sprinkled with remaining 1/4 cup scallions. Per Serving: 438 kcal cal., 0 null Mark as Free Exchange, 26 g pro., 800 mg sodium, 63 g carb., 6 g fiber, 1 g sat. fat, 8 g Fat, total, 112 mg chol.